Going into my pastoral year, I never would have imagined that the Church in the United States would be going through the crisis that it has been enduring over the past few months. The actions of few in leadership have re-opened the wounds that seemed to have been healing and have once again caused much pain to the Mystical Body of Christ. It naturally rouses up anger, frustration, and sorrow to think that some in the clergy and the hierarchy committed such heinous acts against the most vulnerable in our Church. The pain that we feel knowing that our brothers and sisters were and continue to hurt undoubtedly sinks us into darkness. And yet, even in the midst of that darkness, there have certainly been bursts of light shining through, bringing some rays of hope. I look at the love and support that the parishioners of St. Andrew the Apostle Parish in Gibbsboro have given to me and to the priests of the parish during this difficult time. We often think of priests being there during a person’s difficult moments. But the words of encouragement and support from the parishioners have certainly shown me the value of the laity during a priest’s moment of crisis. I have had the blessing to be close to Bishop Sullivan and the priests of the Diocese during this time. To see the firm leadership of our Bishop shows me the value of having a strong shepherd in the midst of danger. And what a strong example he has been in strengthening, comforting, and yes, suffering with his flock! I have also seen how blest the Diocese of Camden is to have good and faithful priests who are working tirelessly in spite of the turmoil to assure that we keep our eyes focused firmly on Christ who is our comfort and strength. I have seen firsthand how much they love us, sacrifice for us, and encourage us and their brother priests. Please keep them in your prayers. Finally, I see how much my brother seminarians love our Church, our diocese, and the vocation that Christ has called them to. 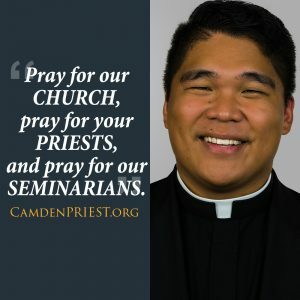 I remember the night I returned to Immaculate Conception Seminary and joined the Camden seminarians from there and Saint Joseph’s Seminary for an evening of prayer and fraternity. While we were all very upset with everything that has been going on, I could not help but to feel that every single man there was rejuvenated in their vocation. A sense of hope filled the chapel knowing that all of us were gathered in the presence of the One who called us to follow and proclaim Him to all people. We were strengthened and encouraged as the Apostles were on Pentecost through a bond that unites us as brothers and as sons of God called to a great mission at this specific time. The Dogmatic Constitution of the Second Vatican Council Lumen Gentium says in its chapter on the Universal Call to Holiness that, “…all Christ’s faithful, whatever be the conditions, duties and circumstances of their lives…will daily increase in holiness, if they receive all things with faith from the hand of their heavenly Father and if they cooperate with the divine will. In this temporal service, they will manifest to all men the love with which God loved the world.” (LG, 41) Yes, we are living in troubling times and yes, we do have to make reparation for the sins committed by some in the Church. But in the end, it is Jesus Christ who has brought about the victory and has triumphed over even the most atrocious of sins. 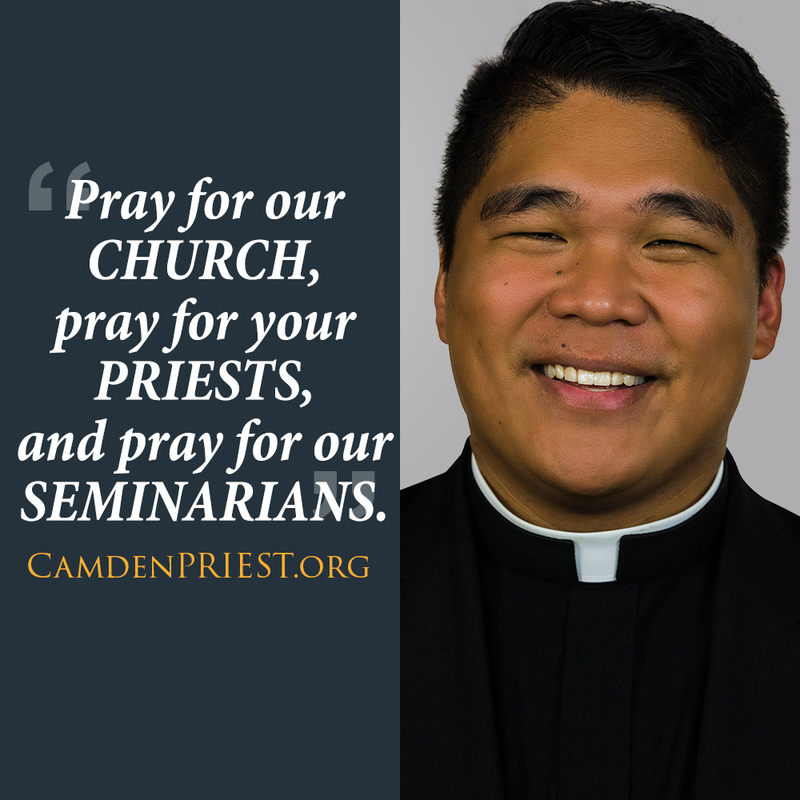 Pray for our Church, pray for your priests, and pray for our seminarians. May our prayers and works show to others that God is our light and our hope. With his grace and the prayers of the Blessed Virgin Mary and the saints, before whom shall we tremble with fear?